Startling figures have been revealed in a in a Freedom of Information request that show that as many as two drivers a day registered in Houghton Regis are being caught out by speed cameras in Dunstable. A 20 mph limit was set there three years ago. And as many as 44 drivers a day who are registered out of Dunstable and Houghton Regis are also being caught. A first offender has a £100 fine and three points on their licence to contend with, or faces time off work to attend an education course that costs £90. The ticketing figures were obtained from Bedfordshire Police Camera Tickets and Collisions Unit. In the charts above, the blue columns represent drivers registered in Dunstable, and the red columns those registered in Houghton Regis. The green columns are for all registered drivers, all areas. Drivers were caught particularly in Drovers Way which has a wide field of vision owing to the open nature of the front gardens, and where motorists may not expect a camera to be. 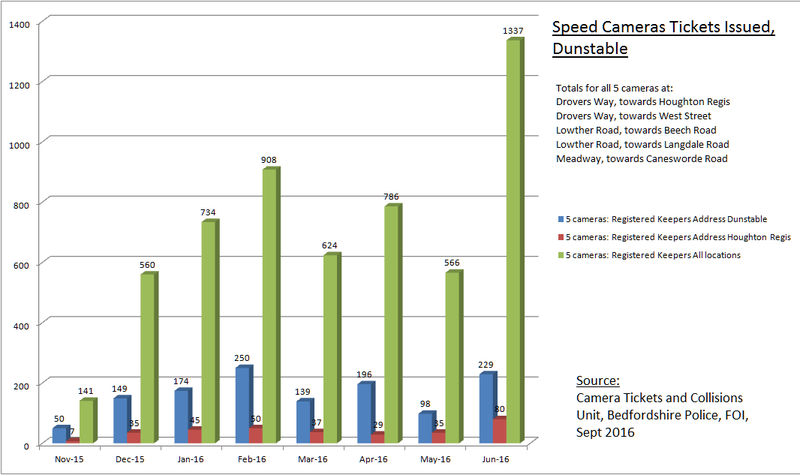 5814 tickets were issued in the three years the 20 mph zones have been active, between July 2013, and the end of June 2016, all caught by speed cameras. The biggest numbers of tickets were to drivers travelling along Drovers Way towards West Street, and towards Houghton Regis. Alan Winter said, "It's been a 20mph cash cow. Until recently there was no large 20 sign painted on the road near the junction with Drovers Way and West Street. Until recent years Drovers Way was a major route to bypass Dunstable town centre. It was a sign-posted route to the zoo." "Central Bedfordshire Council should now demonstrate that they are actually saving lives, and not just using the cameras to collect money." Residents in Dunstable have complained on social media about speeding cars in other roads, such as Chiltern Road, Jeans Way, and even the narrow roads of back streets like Edward St, Princes St, Victoria St, but these are not covered by cameras. As many of these offences have not yet been finalised figures are subject to change. The numerical data presented in the Freedom of Information response is an un-audited snapshot of unpublished data sourced from "live" systems and is subject to the interpretation of the original request by the individual extracting the data. Link to data.